Polianthes tuberose is native to Mexico. It is a deciduous summer-growing, winter-dormant bulb that starts flowering from midsummer. Double Tuberose bears a dense cylinder of very creamy white flowers, packed along the top on tall stems above clumps of grass-like leaves. The blooms are very strongly scented, with a heady, almost overpowering perfume. 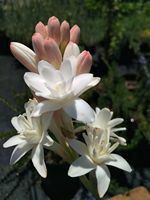 Tuberose does best in full sun, although they will also bloom in partial shade. It is a good cut flower for long-lasting flower arrangements. Easy to grow and it will also do well in patio pots. Although frost will kill the above-ground parts of tuberose, the tubers are quite safe underground. Offsets form readily, so you can easily increase your stock by breaking these off when lifting the tubers. Or, the bulbs can be separated in spring and planted with the pointed ends upward, with about 5cm of soil covering them and space them 10cm apart. They look well in in groups of 10 to 20. Their intoxicating fragrance is often used as a base scent in prominent perfumes and is candidly called the Tuberose.